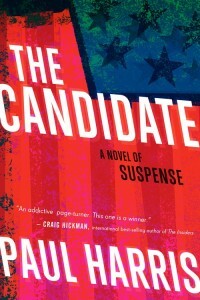 I recently reviewed The Candidate by Paul Harris. You can read the entire review here, but the nuts and bolts of it was that I found it to be an entertaining and fast-reading political/election year thriller. TLC Book Tours is generously giving away one copy of this book to a West Metro Mommy reader. This giveaway is open to any readers in the USA or Canada and will run until midnight on Friday, September 14th. To join the giveaway, please fill out the rafflecopter form below--each participate can enter up to 4 times. The winner will be announced on either on September 15th or 16th (the 15th is my wedding anniversary, so I may not get much computer time that day! ).